Be the first to review this 2018 INFINITI Q60. The 2018 Infiniti Q60 2.0t Pure ($38,950) comes equipped with 19-inch wheels, LED headlamps, keyless ignition, leatherette seating, power adjustable front seats, leather-wrapped steering wheel, dual touchscreens for infotainment and car settings, Bluetooth streaming, and a rearview camera. The Q60 2.0t Luxe ($41,300) comes with more equipment, such as a moonroof and 13-speaker Bose sound system. Available equipment includes blind-spot monitors, a surround-view system, power adjustable steering wheel, heated leather seats, navigation, rear collision prevention, and forward collision warning with automatic emergency braking. 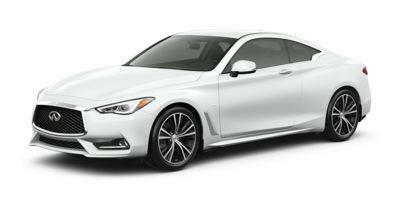 Q60 Pure is available with the 3.0-liter turbocharged V6 and all-wheel drive ($46,300). Also available: the 3.0t AWS Sport ($50,300) and the AWD Red Sport 400 ($54,000). Both the Sport and Red Sport 400 come with just rear-wheel drive, as well. A Technology Package available with some models brings automatic high beams, adaptive cruise control, and lane departure warning with active lane control, using Infiniti’s steer-by-wire system. Pictures don’t do the Q60 justice. In person, it’s striking. The hood isn’t as long as those on other luxury coupes, but it isn’t needed to carry the profile. The edges are smooth, when viewed from the side, and the pronounced shoulders are sleek. A chrome kinked C-pillar dramatically doubles back on itself. The most prominent feature is its big mouth, perched between LED running lights that look like angry squinting eyes. There’s a pinch in the hood formed by lines from the fascia climbing through the Infiniti badge on the grille, leading to a steeply raked windshield. In the rear, there’s a short deck with small spoiler. The fascia makes the wide rear track and tires look wider. The cabin is big and bright, and looks larger than that of other luxury coupes; especially in white, it looks bigger than it actually is. Infiniti is known for the quality of its interior materials, and it especially shows in the upper models where it comes in red or white leather, with accents in silver or graphite, and trim in wood or faux carbon-fiber. The buttons have a secure feel to them. It’s a shame the dual touchscreen system is so problematic. In our Red Sport, sometimes the settings on the top and bottom screens didn’t match, especially the driving modes. And simple actions often require clicking through a complex menu, for example setting the clock. The front seats are wide and accommodating, with optional bolstering that conforms to athletic bodies. It’s easy to find a natural driving position using the standard power adjustment, while the big windows expand visibility. Big fender bulges make it easy to place the front wheels. Rearward visibility isn’t restricted too much by the wide C-pillars. The rear seats appear more inviting than in the BMW 4 Series, although there’s one inch less legroom. The two cars have the same length, but the wheelbase of the Q60 is two inches longer, so theoretically it should have more space in the rear. The glove box is big enough to hold an iPad, but the trunk only holds 12 cubic feet, considerably smaller than the BMW 4 Series’ 15.1 cubic feet. The interior is extremely quiet and composed, thanks to a lot of sound-deadening material. The Bose premium audio system uses new sound compression software and jazz never sounded so good. The base four-cylinder is smooth and quick enough for many Q60 buyers, who care about the car’s smoothness and luxury, not its power. That’s what the 3.0-liter turbocharged V6 is for. It’s fairly new to the Infinity family of engines, cousin to the V6 that’s in the super-fast Nissan GT-R sports car. In the V6 models there is a mind-spinning number of settings available, including damper stiffness, throttle response, steering heft and ratio, and Active Trace Control, an electronic torque-vectoring system that helps the Q60 bite and rotate through corners by applying brakes to inside wheels and adding torque to outside wheels. The 7-speed automatic transmission that’s in the Q60 has made its way around the Nissan/Infiniti lineup a few times now. At low speeds the transmission is hesitant unless it’s being shifted manually with the paddles. At higher speeds it’s more willing. In some cases, the transmission shifts are dictated by the navigation system. It’s a new technology that we question the need for. As if it’s going to get it right. The Q60 also features Infiniti’s latest Direct Adaptive Steering, an electronic steer-by-wire system. In the past we preferred the standard mechanical power steering in the Q50 sedan, but we like this new system in the Q60 just as much. The Q60’s advanced safety systems require the steer-by-wire system. Engineers say it’s quicker to respond, and makes the Q60 more comfortable at lower speeds, and for the most part they’re right, because the Q60’s movements have slowed to a more progressive rate for a better, predictable response. We still felt the need to select Sport+ for the most resistance at the steering wheel, for a more direct feel. So we can say that choosing the safest Q60 doesn’t require a compromise in steering feel. If you don’t call driving around town in Sport+ a compromise. Presumably the transmission is beefed up in the Red Sport 400, with its stump-pulling 350 pound-feet of torque (versus the four-cylinder’s 258 lb-ft). The Red Sport gets a beefier suspension for better grip in corners. It’s a adaptive double wishbone in front and multi-link in the rear. The Red Sport’s power comes on fast, happily smoking its wide 265/35R19 rear tires. But it’s not so happy slowing back down, as we wish the brakes didn’t fade so quickly. The base Q60 gets 12.6-inch front and 12.1-inch rear rotors, while the Red Sport gets four-piston 14-inch front and two-piston 13.8-inch rear brakes, so it stops quicker, but not necessarily more times without overheating. After a half-spirited sprint in the hills outside San Diego, we smelled the pads smoking. With a car that flaunts such beauty, we wonder if a four-cylinder engine making just 208 horsepower is style-appropriate. And the 400-hp Red Sport has some tough competition as a full-on sports coupe, although Infiniti buyers probably don’t care about that, with looks on their side. So maybe that leaves the twin-turbo V6 in the middle. Just don’t let the navigation system do your shifting for you. 2018 INFINITI listings within 25 miles of your ZIP code. Find 2018 INFINITI listings for sale near you.